I assumed that we probably couldn't grow this particular perennial here in Illinois but after reading an article in the latest The American Gardener Magazine and doing some research, I realized that there are several Phlomis species that are hardy to zone 5. The first, Phlomis fructicosa is shrubby evergreen in USDA Zones 8-10, but here in zone 5, plants typically die to the ground in winter with the roots still surviving. The gray-green leaves of this mint family member have a sage-like appearance but no aroma or taste. 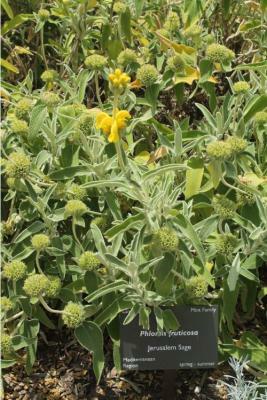 On this Jerusalem sage, whorls of bright yellow flowers bloom in spherical clusters along the upper half of stems and at the stem ends in summer. Additional flushes of bloom may occur throughout the remainder of the growing season if stems are promptly cut back after flowering. This Jerusalem Sage will grow to be about 3 feet tall at maturity extending to 4 feet tall with the flowers, with a spread of 3 feet. Phlomis russeliana is the Jerusalem Sage I read about in the magazine. 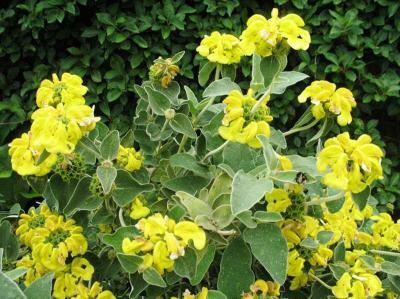 This sage features tiny, tubular, hooded, 2-lipped, pale yellow flowers in whorled clusters bloom from July to September. These flowers are followed by ornamental seed heads which remain attractive throughout fall into winter. This particular perennial is hardy to zones 5-9 and is easily grown in organically rich, fertile, dry to medium moisture, well-drained soils in full sun. It typically grows to 3' tall and to 2' wide. This is definitely a perennial I want to try in my landscape!